We have had the pleasure of working with Anthony and Lydia for the past year and a half. 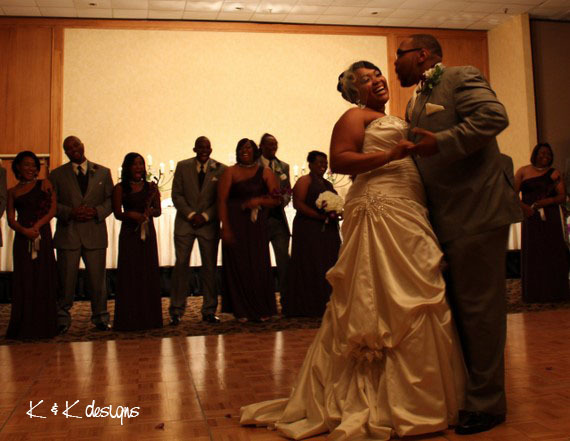 They came to us in early 2010 to create the wedding of their dreams. 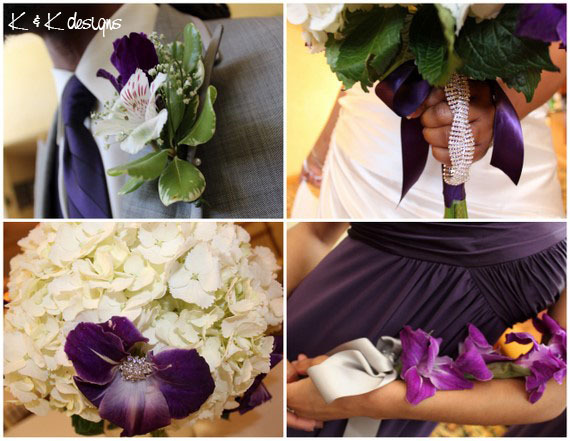 When we first met we tossed around lots of ideas and color schemes and when all was said and done ended up with a beautiful rich purple (have I mentioned that purple is a HOT wedding color?) creamy ivory and a punch of silver. As you can imagine the outcome was simply breathtaking. As always we start with the invitations as a building block. 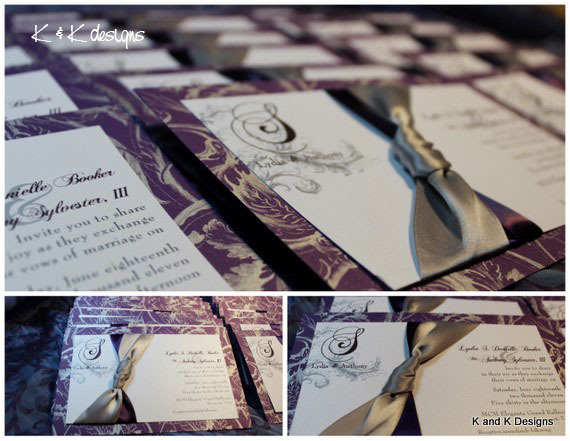 You might remember me mentioning the invitations here but just in case you don’t I will share them with you again. 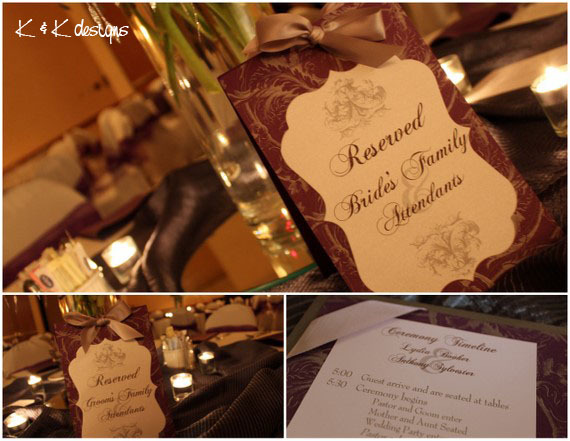 We used a beautiful purple and silver printed paper as the backdrop with a shimmery ivory paper printed with silver lettering. Tying it all together were the silver and purple satin ribbons. Aren’t they beautiful?! Lydia did as a lot of brides are doing today and that is having the ceremony and reception at the same place. We played around with a lot of different ideas in regards to the seating. We had a huge quest list to work with and then you add the logistics of resetting the room after the ceremony to get ready for the reception, my head hurts just thinking about it. Ultimately we decided on having the guest sit at the tables during the wedding ceremony instead of reworking the room afterwards. I must say, all of the guest loved it. 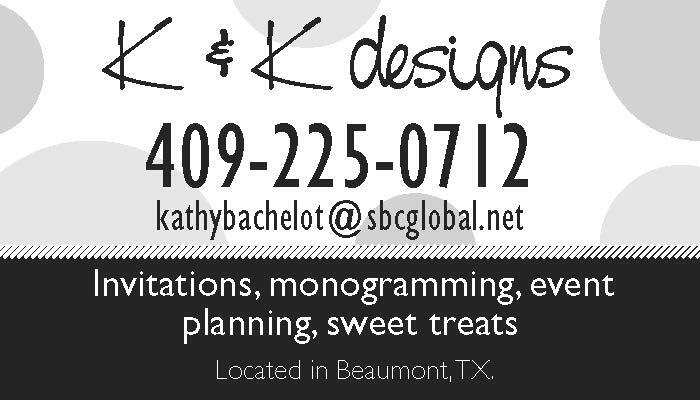 We have done this several times and always get rave reviews. 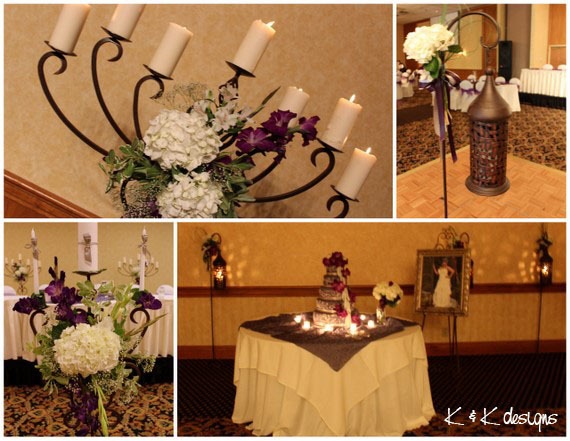 We created an isle with beautiful lanterns adorned with fresh flowers and satin ribbons. We used the same flowers, white hydrangeas and the most beautiful purple gladiolas I have ever seen to adorn the unity candle and candelabras for the ceremony. After the ceremony we moved the lanterns to the edges of the room to create a beautiful glow. For Lydia’s bouquet we did a ball of hydrangea with a few single buds of the purple gladiolas with crystal embellishments to add a pop of color and some sparkle. We wrapped the stem with a purple satin ribbon and crystal embellishment to finish it off. The bridesmaids carried a single stem of hydrangea with a silver satin ribbon that created a very elegant effect. For the boutonnieres we added a little texture with the addition of white alstroemeria that had just a touch of purple to them. For the linens we set the tone with a classic ivory base that made the beautiful purple toppers that we softly bunched in the center of the tables really pop. 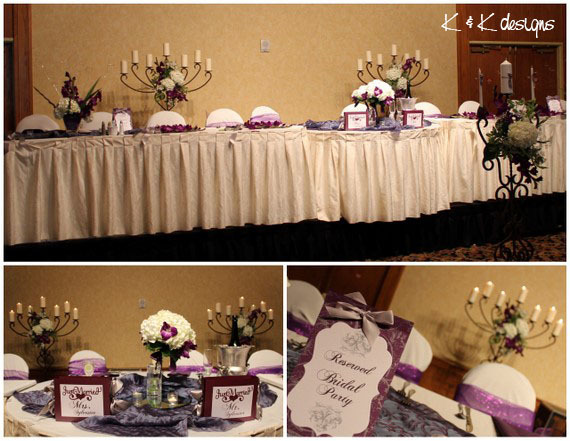 We used purple chairs ties with a touch of metalic threading for that extra sparkle. 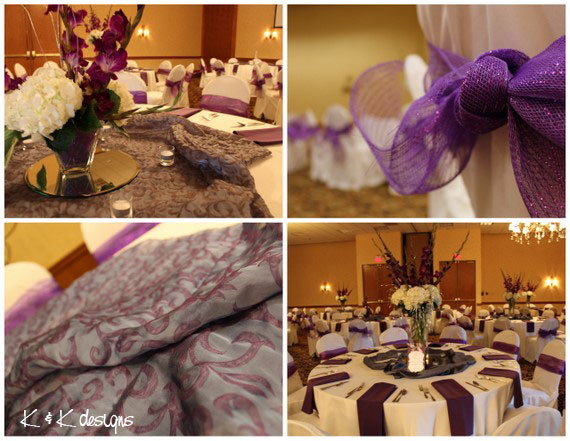 The rich purple napkins finished the look of with a bang. 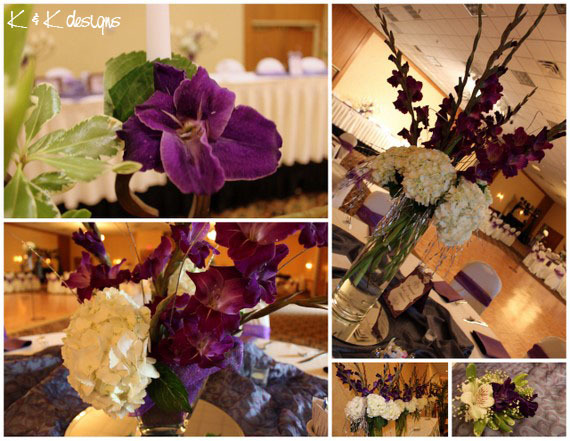 We used two different styles of centerpieces in our design. We used tall vases with a neck of hydrangea and suspended gladiolas at the top of the vases to give us the extreme height we needed for this venue. We also did a shorter arrangement of the same flowers that added great color and texture to the tables. 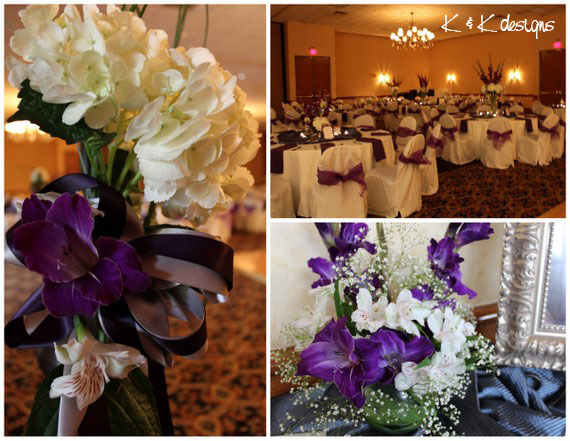 These were some of the most beautiful flowers we have ever worked with and the vivid purple next to the soft white of the hydrangea added so much drama. We used the same design from Lydia’s invitations to create all of the signange at the wedding to give it that very personal touch. Tons of glittering candlelight at the head table and throughout the room gave the wedding such a soft romantic feel. 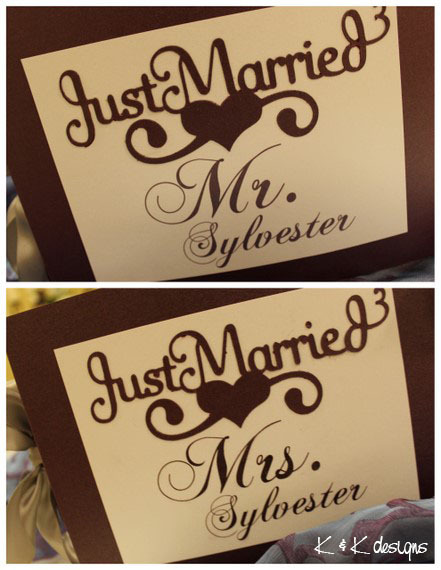 And no K & K event is ever complete without custom signs for the couple of the hour placed at the head table. Thank you Anthony and Lydia for having the faith in us to make your special day everything that you dreamed. 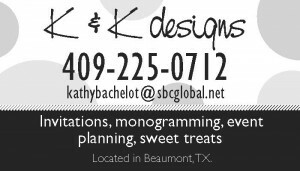 Your were such a pleasure to work with and we wish you all the best in your new life together. Congratulations Mr. & Mrs. Sylvester! !